What Came First, the Chicken or the Pasteur? So, you know how when the store employee comes up and says Can I help you? and you're thinking There's not a snowball's chance in you-know-where but then you go ahead and take the plunge to ask for help anyway in spite of the fact that previous experience is screaming Stop! Back away!? Do you have any pasteurized eggs? The Worker looks at me and he is pursing his lips and pulling them to one side, like that Rugrats kid. Angelica, yes. Note: The Daught does a mean impression of that kid. He has longish dark hair and he flips it, a little. When he speaks he has an accent, French I think, and I am suddenly imagining him in a beret. Pasture eggs? I do not know of such things. He calls to a buddy, a larger dude, hairless to speak of, who is balancing several cartons of eggs on his belly. Do we have eggs from zee pastures? Buddy looks confused by The Frenchman's question. No, I am saying, pasteurized eggs. The Frenchman's hands land on his hips. Are you meaning eggs that come from zee chicken in zee pastures? I do not know of chickens in pastures. I am thinking about how all American children learn about Louis Pasteur, who, with a name like that has got to be French and how he saves all of our lives from germs and stuff in our food supply through the process of pasteurization but somehow The Frenchman seems oblivious to the greatest achievement of his Fellow Countrymen, so far as I know, except perhaps for the croissant, which is plenty impressive. Note: Okay, fine. I don't eat croissants. So, finally I just grab a dozen eggs laid by certified free-range chickens which is very close to a pasture-ized egg, yes. Thank you for calling. My Name is Peggy. What is Problem, Please? Note: I am lying about the helpful part, yes. Helpful Dude: Thank you for calling. How may I help you? Me: I subscribed online to your newspaper and I'm trying to figure out why we're not receiving it yet. A protracted moment of silence follows. I can not bear protracted silence, as you know. So, I speak, obviously. Me: Well, can you check your database and see if my credit card payment went through and that I am listed as a subscriber? Helpful Dude: Not really, no. But I can set you up as a new account. Me: But I don't want a new account because then I may receive two newspapers. I only want one. I just need to know if you have received my payment and activated my service. Helpful Dude: I guess you will just have to wait awhile and see if you get a newspaper. Me: What? You can't check? Helpful Dude: No. I don't have access to that type of information. Me: What type of information do you have access to? Helpful Dude: I can start a new account for you, M'am. Me: I still don't want a new account. Can you just start sending me the paper until someone figures this out? Helpful Dude: Would you like a trial subscription, M'am? Me: Sure. I mean, I really want a regular subscription but I guess I'll take a trial subscription for now. Helpful Dude: Oh, sorry. I can't give you a trial subscription if you want a regular one. Me: Fine! I changed my mind! I don't want a regular one anymore. Give me a trial subscription. Are you kidding me? Am I on Punk'd? Note: For those readers who need relevancy training, Punk'd is the modern-day equivalent of Candid Camera. Me: What am I supposed to do to get a newspaper? Helpful Dude: I have a phone number that you can call. Perhaps they can help you with your problem. I am wondering if this dude's name is Peggy and he's sitting in Alaska or Fargo in a remote cabin answering the phone. Helpful Dude: Please call 1-800-555-1111. Me: That's the number I just called to get YOU. Helpful Dude: Oh, well thank you for calling. How may I help you? So, apparently I am missing out on an important form of self-expression, but I cannot be blamed for the oversight. I simply did not know. 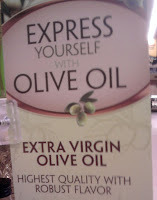 I simply did not know that I can express myself with olive oil. Note: I know, I know. So many good and expressive years, lost. Oh, sure. I have tried the conventional approaches to self-expression, such as but not limited to words, wild gesticulations, dirty looks, teeth-baring and whatnot, particularly upon encountering Stupid Drivers. I have also tried the artistic approaches to self-expression, such as but not limited to writing, poorly-executed arts and crafts, modern dance and cleaning. Note: Okay, fine. The modern dance part was just to impress the Lovely DIL, who clearly knows better. Additional Note: Cleaning is so a form of self-expression. Darned Non-Believers. But olive oil? Never tried it. Just seems too darn slippery, really.